Browse through these easy tips for organizing kitchen drawers and kitchen cabinet organization to get the hub of the house under control. Kitchen organization is crucial. This high-traffic area often becomes a multipurpose room in which meal preparation no longer solely dominates the space. Cooking occurs along side the message center which is next to the homework headquarters that is adjacent to the mail station and so on. Very understandably, the hub of the house can quickly become chaotic and give the impression that restoring order is an unattainable goal. Below you'll find step-by-step instructions on organizing a kitchen, a guide for where to store what and suggestions for kitchen storage organizers. The kitchen has a distinct purpose and with the following kitchen organizing tips, you will be on track in no time! •	Start by going through ONE drawer or cabinet at a time. (This first little tip is crucial to successfully organizing kitchen cabinets, etc. Remember, slow and steady wins the race.) Get rid of any items that are unwanted, never utilized, or no longer usable. •	Pick up ONE item at a time, and decide if it is worth keeping. In order to accomplish this, ask yourself appropriate questions (Is it still usable? How often do I use it? Do I have more than one of this same item?). •	Take out the trash, and put the donations in your car. This hinders the possibility of undoing your hard kitchen organizing work. •	Remember, kitchens often transform into multi-purpose rooms. For complete kitchen organization, don't forget to purge the junk drawers, office/message centers, recipes, menus, the pantry, the fridge and so on. •	You have pared down, and now you can focus on what's left. Sort the remaining items by category or by use that makes sense to you (i.e. knives, cutting boards & other prep tools; pots, pans, baking sheets & oven mitts; tupperware, foil, saran wrap, & ziploc bags and so on). ⁃	Stove/Oven: Use adjacent cabinets to store pots, pans and baking sheets and nearby drawers for oven mitts. Frequently used cooking utensils can be kept in a container on the counter, while the rest can go in a drawer. A kitchen drawer organizer is helpful here! ⁃	Near Refrigerator: Utilize nearby drawers and cabinets for Tupperware, tin foil, saran wrap and any other items that assist in leftover transport. If necessary, purchase a kitchen wrap organizer to keep these products orderly. I use kitchen cupboard organizers like this one and love them! ⁃	Coffee (if frequently consumed): Keep the coffee maker, and if necessary, the grinder on the counter by an outlet. Store mugs in a nearby cabinet for easy access. ⁃	Counter Space: Usually counter space is limited. When organizing kitchen cabinets and drawers, reserve the counter for the items used on a regular basis. Everything else should be relocated to a kitchen cabinet with space or another appropriate storage area in the house (i.e. holiday platters can be stored with the other holiday items). ⁃	Office/Message Center: Since it's such a high-traffic room, it is highly beneficial to have some sort of message center. If you have a built-in desk area, set it up as the message center by stocking it with the appropriate office supplies and a telephone. This is also a good place for a computer to easily access online recipes. If your kitchen does not accommodate a small office, then a corner or area of the counter with a phone jack and outlet will suffice. Install a cordless phone to free up counter space, and use a nearby drawer for post-its, pens, and any other necessary office supplies. Mount a small cork board on the wall for displaying messages and reminders to family members. Implement a rule that once the reminder or message has been taken care of that it must be removed from the board. - Paper: Don't forget to organize recipes, menus, coupons and any other kitchen-related paper. **Note** Designate sections of the refrigerator for certain items (i.e. cheese in dairy drawer, condiments on door, etc.). Use fridge bins or handled storage baskets to further organize the shelves. This makes your weekly clean outs fast and easy. •	Do the same thing with the pantry; trash items that are no longer good. **Note** Designate sections of the pantry for certain items (i.e. snacks on one shelf, canned goods on another, etc.). Consider purchasing a kitchen pantry organizer or organizers like mesh stacking bins. This makes your biweekly declutter sessions quick and simple. •	If you have a message center in your kitchen (recommended), once a week go through and make sure office supplies (and only office supplies) are in that area. You don't want to find a stapler in the utensil drawer and vice versa! **Do this for all the other random items that end up in this high-traffic room. This is a biggie when organizing kitchen cabinets, drawers and counters! Kitchen organization products add convenience to your everyday routines. Have fun organizing your kitchen with these innovative items! Organizing kitchen cabinets is a snap with Rev-A-Shelf. It has solutions for every cupboard in your kitchen. Check it out! An essential for pots and pans, this convenient product eliminates losing cookware in the back of low, deep cabinets. Its removable plastic sheet not only protects from drips and/or spills but is also easy to clean. Kitchen cabinet organizers like this corner shelf are fantastic! I use it to hold dishes as well as to separate pans. It's sturdy, versatile and very affordable! Successfully utilize the space underneath your kitchen or bathroom sink with this awesome organizer. The second tier can be conveniently installed on either side of the base to avoid pipes. With the most drawers in the house, these are very resourceful for kitchen organization. These kitchen drawer organizers offer a modular kitchen design that work with each other as well as stands alone. Piece them together as a customized solution to any drawer challenge. Everything Drawer Organizer - a Kitchen Organization Favorite! The junk drawer - everyone should have one but now it no longer needs to be pandemonium. The Everything Organizer offers 23 compartments and two tiers for sorting success. These Rubbermaid food containers are fabulous! This particular one revolutionizes bringing a salad for lunch. Great use of the pantry's vertical space and shelf depth, this rack has three tiers and dividers to separate cans by likeness. Remove one and the can behind it automatically come to the front. What a kitchen organization dream! These airtight containers are excellent for food storage. They are safe for the freezer, refrigerator, dishwasher and microwave! Double Stainless Steel Turntable - A must for organizing kitchen cabinets! Versatile, convenient, and rustproof, this product is a kitchen organizing essential and can be utilized anywhere. Get creative! For instance, use it to efficiently store pantry items such as cans and jars. Eliminate the need to stack! These kitchen organizers are handy stacking storage bins that are designed for easy reach in and great for pantries! Use them to store small bags of chips, sugar packets, tea bags, and other oddly shaped pantry items that end up scattered on the shelves. An awesome product, these plastic storage baskets have handles for easy access. Use them in your fridge, in your pantry, in your cupboards, anywhere! 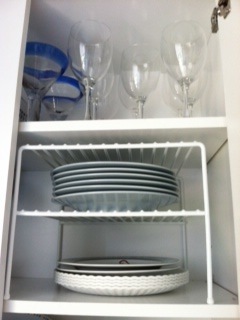 This kitchen organization product is fantastic! With it, your fridge will never be the same: keep food organized, contain any leaks or spills, and easily pull out what you need.